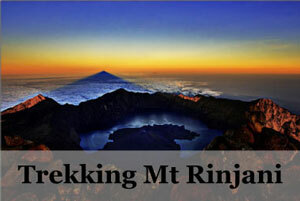 Mount Kelimutu is a volcano in Flores, one of the many volcanoes of Indonesia. The highest peak here is the Mount Kelibara of 1731m tall. 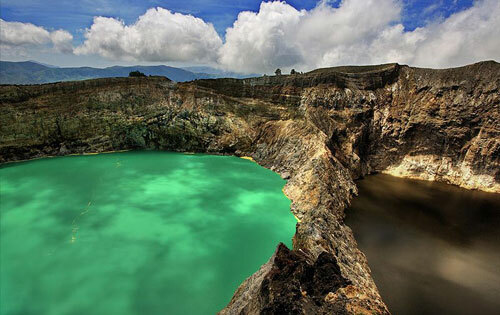 One of the most famous attraction here for travellers is the tri-colored Kelimutu lake within the summit of the craters at 1690m. It consists of three lakes together of varying colours from each other and also at different times, making them surreal and exciting to be discovered. One of these lakes is Tiwu ata Mbupu (Lake of Old People) which is usually blue and on the westernmost of the three lakes. The other two lakes are Tiwu Nuwa Muri Koo Fai (Lake of Young Men and Maidens) and Tiwu Ata Polo (Bewitched or Enchanted Lake), where both of them are green or red respectively and are only separated by a crater wall. 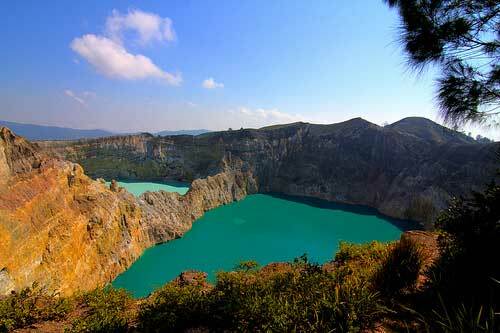 Mount Kelimutu is located in Kelimutu National Park on the island of Flores, Indonesia. It is near a small town called Moni, which is about 50km east of Ende of Central Flores Island and 4 hours ride from Maumere the city of Flores. 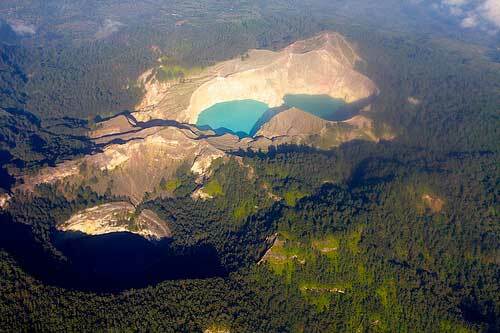 The tri-colored lakes of Mount Kelimutu are special for natural occurring phenomenon. Due to the ever-changing colours and the varying colours amongst themselves, it is beautifully haunting. The local people here consider it as a resting place for the departed souls. They believed that Mae was a god of the afterlife and those who died will sit by the lakes base on their merits in life. Therefore, it is connected to the names of the lake, when translated meant one for the souls of the people, another for the spirits of young people and lastly for the spirits of soothsayers. These lakes change colour dramatically and unpredictably from blue or green to red or black, making it one of the natural phenomena to be beheld by many. Moreover, the precariously steep road to get there makes it so much more mysterious and mystifying. 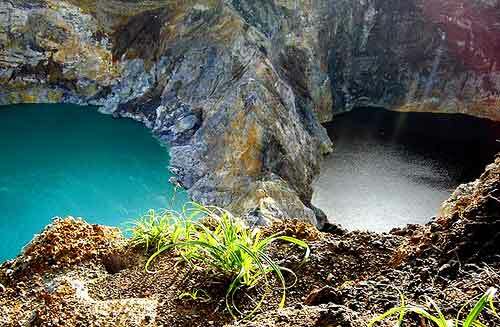 The best time to visit the Kelimutu Lakes is during the dry season of Indonesia tropical weather, which is May to September. The best of best time is July or August, making it also the most peak time where you should make advance booking of place to stay and such. To visit the lake, the best time is when during sunrise for its most dramatic atmosphere, which you have to wake as early as 3.30am to be able to make it. The Tri-colored Lakes of Kelimutu, of course. The first and second lake are located next to each other while the third one is located 1.5km west of the two. The boundaries between the lake is a narrow stone wall of a crater which is very steep and with the height of 50-150 m. Scientifically, the colours of the lakes change due to the discoloration by the sunlight, the water microorganisms and the dissolution of chemicals. It also includes the reflection from the colours of the walls and bottom of the lake itself. 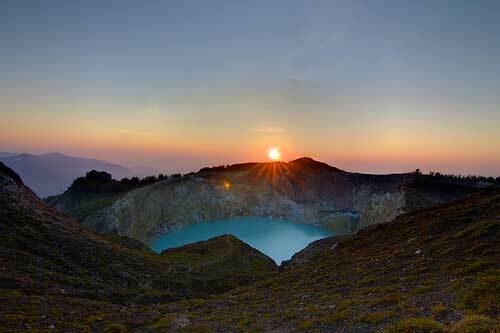 Catch the sunrise at Mount Kelimutu overlooking the lakes. Start by taking a truck up the 8 km path to Kelimutu lakes and then another 45 minutes upward drive just in time to catch the sunrise. 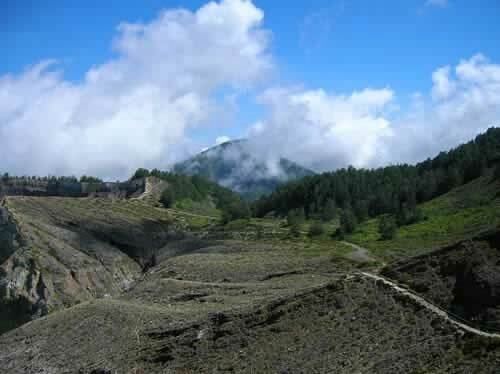 Hike and trek around Mount Kelimutu. You can explore the crater and then walk all the way back down to Moni if you like, or ride back the way you came. 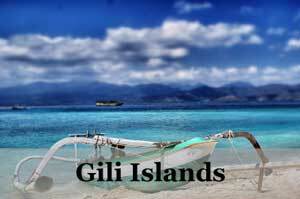 If you are more adventurous, you can choose to stay in Moni which has some choices of guesthouses of minimal facilities. One of the choices here in Moni at Mount Kelimutu is Daniel Lodge * and another just at the edge is Antoneri Lodge *. For more comfortable options, you can choose to stay in Maumere * which is 4 hours away. There is also another choice to stay in Ende * which is sort of in between range between these two. At the nearest town Moni, there are only few restaurants to choose from and some local market stalls. Remember to pack enough food for energy on your journey to the tri-colored lakes as it would take time and especially if you decide to do your own trekking. You can find drink sellers at the crater. 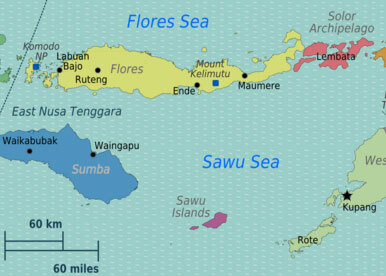 The nearest airport is in Maumere and Ende, Flores. There are regular flights between Bali and Maumere. 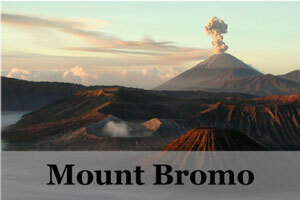 The nearest location to Kelimutu is Moni. 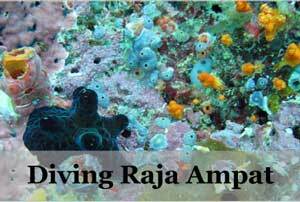 You can come here from several options – Maumere or Moni, both which you can fly into. From Maumere, you can take about 4 hours ride to Moni. From Ende, the flight will arrive at Kupang airport, which you have to ride 40 minutes to Ende and then another 2 hours ride to Moni. 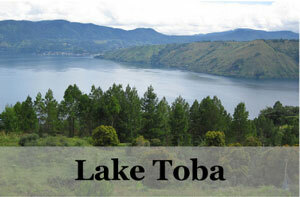 From Moni, it is just another 45 minutes drive to reach the lip of Lake Kelimutu. Many travelers would take this option. But you can also choose to walk, which will take 2.5 hours one way. You can take a ferry boat from Bali or Lombok to Flores, which would take around 3-4 days depending on your cruise package that would mostly include stops at places like Komodo National Park, other villages and also here at Kelimutu lake. You can rent a vehicle to get around from town to villages and the Kelimutu lakes, but you can also catch the public bus if you like. 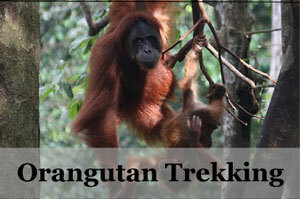 The rest can be covered by foot of some light trekking as well as tough hiking. 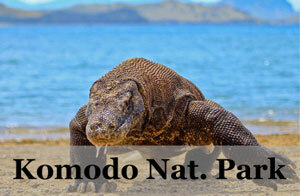 Komodo National Park, one of the UNESCO World Heritage Site in Indonesia, it is the home to the famous Komodo Dragon in Indonesia, one of the few left in this world. Always pack enough to go food in your backpack and water as the journey on land is long while the trekking is hard and far from where you can get them. Also, if you have trouble with long bumpy overland journeys, don’t forget to get your medication to ease the ride. The roads here are winding, bumpy and often long. Great post! Very informative and helpful. I’m planning on heading to Flores next month and can’t wait to do this hike during sunrise!